There is much to say...so much to say...where to start...hmm... Lets go by topic! Revisiting the subject of my birthday, my good buddy Jon came to visit over that weekend. I don't know why he keeps returning...I'm always forcing him on these death marches through dog-hair or traipses across rivers while wearing snowshoes. I guess he gets to experience what being a field biologist is really like: tripping on your own snowshoes, falling headfirst into the snow, getting whacked in the face by needled branches, ripping the seams in your favorite gloves, crashing sideways into the cold water of the Gibbon River, whipping around on blisteringly cold mornings on snowmobiles. Jon endured all these things with great humility and humor. However, alongside all these pride-decimating events in the field, Jon got to experience the rewards of it: intimate elk encounters, wolves surprising us from the woods and howling from ridge-tops into the valley below, lunches in the warm sun while sitting in bison forage trenches in the snow, admiring the beauty of frost- and fog-filled mornings shifting to delayeringly warm, bluebird days, skiing into geyser basins where no other human tracks could be found (except for mine laid the week before! ), listening to wolf capture operations (to collar more wolves) over the radio as they occur ("kkksshhhh.....he's in a good position now....kkssshhh....probably won't toboggan down the hill if he goes down there...ksssshhhh.....don't forget to leave a collar with Joe"). 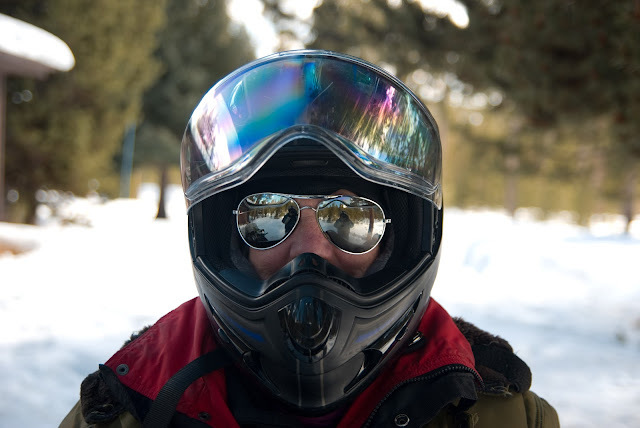 The extremely warm temperatures and sunny days of the past several days have melted the park roads, leaving extended stretches of either slush, lakes, or bare asphalt; none of which are very fun to ride a snowmobile on. The park has closed the Firehole to guided groups, and will be plowing from Norris Junction to Madison Junction beginning tomorrow. Soon, we will be back to the good ole Ford Explorers. We've already put three sleds in storage, and Megan is, as I write, headed to Bozeman to pick up one of the Explorers. I really can't believe that the winter is nearly over...it has gone by soooo fast and has ended so abruptly (as far as switching from snowmobiles to vehicles). Of course, the winter is not over for the elk and wolves. There is still snow limiting food availability for the elk and limiting the wolves' ability to chase the elk. On February 28, Megan and I were hiking on wolf tracks in separate areas, and nearly simultaneously came across grizzly bear tracks. This is quite early, since the bears usually come out mid- to late-March. The second I came across the fresh grizz tracks, all of my senses came alive. And just moments before, I had blundered through an old bison carcass. Yellowstone, in an instant, has changed. For us, we can no longer saunter along with our heads down, following wolf tracks, getting lost in our thoughts. To do so could be fatal. The bears are very hungry and also very protective of any food they find. During normal winters, there is plenty of winter-killed elk and bison for the bears to scavenge on, but this winter has been far from normal. All of our necropsied kills have plenty of marrow fat remaining and we have found no animals that appeared to die due to the winter, so the bears will probably have to do some hunting for themselves or steal kills from the wolves. Later in the week, we were alerted to a bison carcass by Caroline, an interpretive ranger. 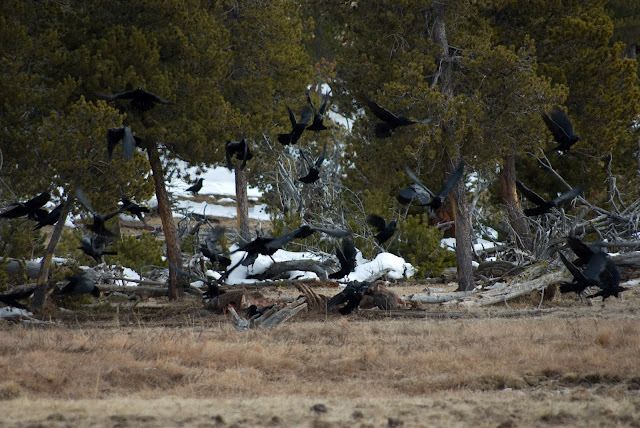 With much yelling and eyeing of the forest edges, we flushed the 30+ ravens off the carcass as we approached. The necropsy found significant subcutaneous hemorrhaging on the hump of the very healthy (lots of fat in the hump and marrow) cow bison, indicating that she was killed by a bear. Grizzly bears often attack from the front, as opposed to wolves, which typically attack from the rear. The bears basically give their prey a good swat in the face or jump them from the side and latch onto their back. We now travel in pairs anywhere we hike and ALWAYS have bear spray near our ready hands. Recently, we have begun watching the ladies' butts for extended periods of time, waiting eagerly to see if they poop. And then we go spoon it up and put it in a bag. I'm talking about our collared elk...sheesh...you think I'm some kind of weirdo??! Still sounds weird? Because the poop can be analyzed for levels of progesterone, thus indicating pregnancy, we collect poop from known individuals in the spring to obtain an estimate of the percentage of females in the population that are pregnant. And so, we can often be found with our binoculars trained on the white crescent rear-end of the elk, waiting for the telltale sign of pooping: the tail lift. The hardest part is marking exactly where the poop falls. It is easy to think that you know where it is, but when you hike to it, suddenly the poop is not between that log and that rock, or there are a dozen other poop piles around. Hope the word "poop" doesn't bother you, because I used it a lot just then. 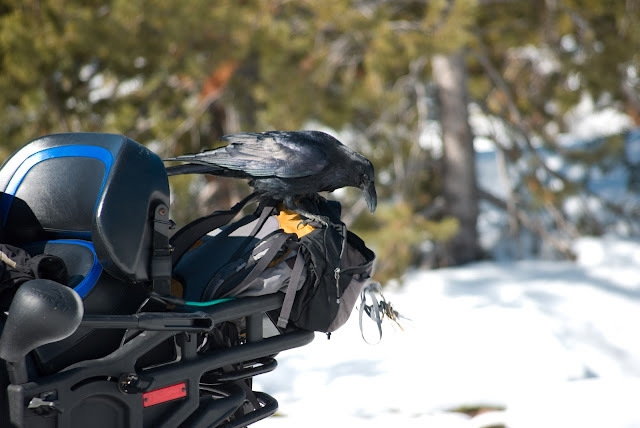 Every year, the Montana Chapter of The Wildlife Society holds a conference to discuss wildlife and wildland issues, showcase current and past research and management activities, and socialize with like-minded biologists. Megan and I both enjoy the conference enough to make it a priority every year, and so, we left our wolves and elk for three whole days (! ), crossing our fingers that our collared elk wouldn't get eaten while we were gone, and traveled to Helena. Little did either of us know, Christmas came quite early this year. Megan is an aspiring ecologist, like myself, and has been earnestly seeking a path to attain it. She has been through several ups and downs with trying to get into Grad school (taking the GRE twice, nearly doing a Master's on moose only to have it fall through). She didn't really know what she was going to do next. The second night of the conference, at the hotel bar, Bob (our current boss) offered her a Master's opportunity with mountain goat research in Montana. This was what she has been secretly hoping for some time, to be a graduate student for Bob, but she could only hope. She was/is stoked. I didn't get much time to talk with Bob, but the very short time we did talk, he gave me my present. I am officially going to Antarctica in October for Weddell seal research! I was/am stoked. And little did Bob know, he was not excluded from the gift-giving. Several of his former and current students (about 20 of us) nominated him for the Bob Watts Communication Award, a fairly prestigious award recognizing a biologist who has had considerable impact in the scientific world via publications or other media outlets. We nominated him for his 20 years of research in Yellowstone that resulted in a publication of a textbook size book outlining the findings of this longterm project. It is a true ecology book. It is not simply wolf and elk research. He combined research on the environment (snowpack, topography, vegetation, etc) and the demographics and dynamics of the large mammal populations. It is probably the most integrated and exhaustive research published about the park ecosystem. Bob more than deserved the award. He was/is stoked. The "Who" pack is no more. We will never again wonder "who are those wolves?" or "where are those wolves now?" The uncollared pack has been collared. The pack that has evaded the hand of man for many years, now has the print of man upon them. And it was all my doing. It was just a normal day, nothing out of the ordinary other than my snowmobiling my mother back to West Yellowstone after a great momma visitation. Rounding a corner, I saw out of the corner of my eye what looked to be several wolves in a clearing, and indeed, after slamming on my brakes (and probably giving my mother whiplash, sorry ma! ), there were eight wolves lounging about with a picked-clean elk carcass lying in the river. The pack I knew immediately...collarless, five black, three gray, the massive silver-tinged black alpha male with a limp, the two young-looking grays feeding on the carcass then frolicking into the woods playing. The wolf office for the park has been very interested in trying to collar this unknown pack, but has been unsuccessful on numerous attempts to locate them or get them in a good location for collaring. Knowing this, I gave them a call. 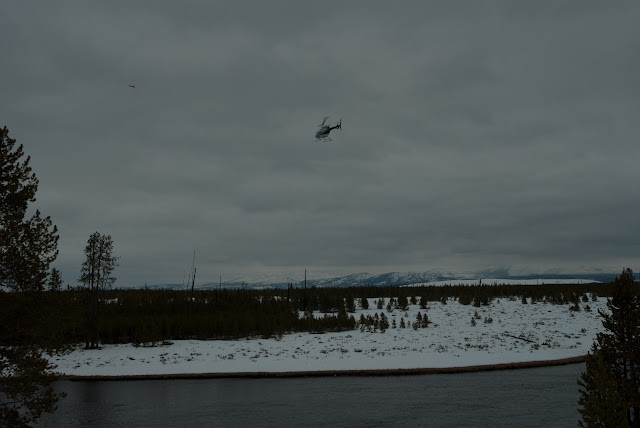 They immediately sent a fixed-wing aircraft (a yellow plane that we have seen flying numerous times locating wolves in Yellowstone) to check out the location of the wolves that I provided. The clearing wasn't ideal, for they need large, open areas to stay on the wolves with the helicopter, but they decided to give it a try. The wolves eventually disappeared into the trees, so Megan and I stationed ourselves on the road overlooking where the wolves had been on the carcass to monitor them if they reappeared. Approximately an hour later, I heard the pilot of the helicopter on the radio stating that he was at Madison Junction, and not minutes later, the helicopter arrived. Both the plane and helicopter worked in concert from then on out. The yellow plane swooped in on the wolves first, showing their location to the helicopter pilot. The plane then gained altitude and began circling the wolves while the helicopter came right in over the wolves. 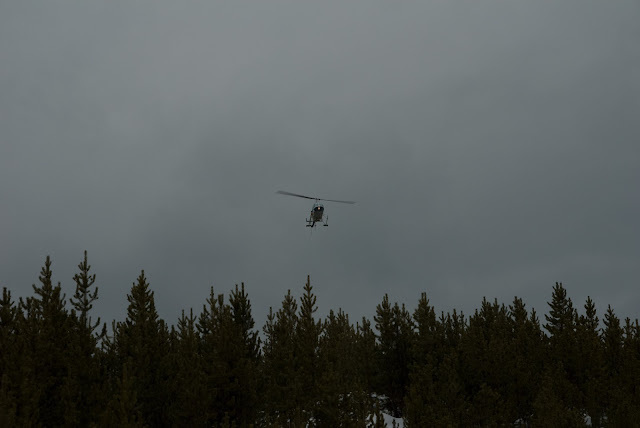 We could see Doug Smith (the park wolf biologist) hanging out the side of the helicopter with a dart rifle. The helicopter flew very low, seemingly dangerously so, above the wolves, and we saw Doug aim the rifle several times. On the radio we heard "got a dart in one of them, going to try for another." While the helicopter sought another wolf to dart, the plane began circling the darted wolf so as not to lose sight of where it went. Another dart was put into another wolf. The helicopter then switched back to the first darted wolf and landed nearby to drop Doug off to begin the data collection and collaring. The plane then began circling the newly darted wolf to monitor its movements. From Doug on the ground over the radio: "large black wolf, silver muzzle...the one we thought was the alpha male, what do you think?" Me: "yeah, that's the one we thought was the alpha male too. Should have an inward bent wrist on the right front...?" Doug: "yeah, just noticed. Looks to be an old broken leg that has healed over. Can you try the frequency on your equipment to see if it works." Me: "signal loud and clear!" The other darted wolf turned out to be a small, gray female yearling, about 80 pounds. The alpha male weighed in around 130 pounds (huge difference! ), and was about 3-5 years old. "Hey Jesse, this was huge that we were able to collar this pack. We couldn't have done it without you guys, so thanks!" This is bittersweet to me. It is great to have been part of the collar operation and furthering the research and knowledge of the park wolves, as well as to have been thanked by the big man himself, but it seems that some level of wildness has been taken away from the pack. In reality, the collaring operation will probably have no long-term effects on the wolves, but just knowing that they have been touched by man, and to know exactly where they are all the time now that they have collars, is sort of disquieting to me. I have come to have a great appreciation for this pack, and it feels that my connection with them has been disrupted. On the other hand, it makes my job easier from here on out! The wolf office also let us know that we should think about what we wanted to name this pack...which is a great honor. The official naming will ultimately depend on the genetics that they get back (whether it appears to be an uncollared pack they have had in other areas, like the Bechler pack, or whether the genetics suggest it is related to the Gibbon or Cougar packs). We suggested the "Madison" pack, due to its inhabiting the Madison drainage for about a month and a half (maybe more!) this winter...the longest any pack has stayed and not left a drainage in our study area. (she never gave me any....warnings, I mean): NEVER, NEVER HIKE ALONE 21 MILES ALONG THE MADISON, ESPECIALLY WHEN THE BEARS ARE OUT! “Delayeringly warm, bluebird day” is my new favorite compound adjective. I’m going to start using it every chance I get. 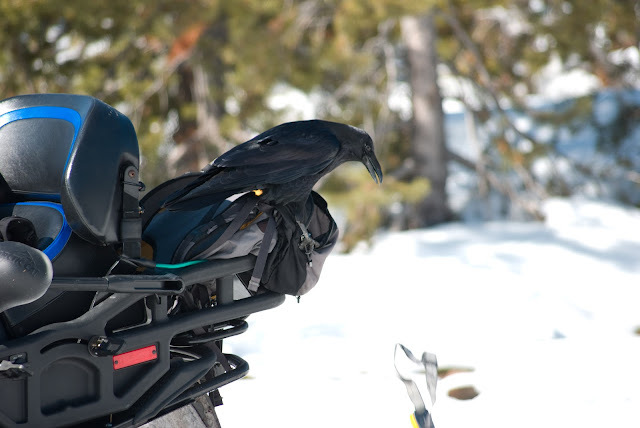 I love your raven photos. They are such interesting birds. Jesse!!! Antarctica!!! That is fantastic!!! !